What Is a Butter Ability Snowboard? Courtney McCaffrey graduated from the College of Charleston in 2008 with a B.A. in media studies. She has served as an editor for Blooming Twig Books and the MADA Writing Services publishing company. 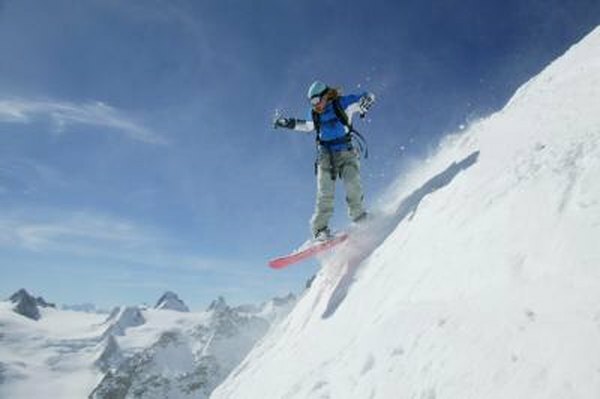 She is now a writer on various outdoor sports such as snowboarding, skiing, surfing and bodysurfing. Flatland snowboard tricks can be a fun way to impress your buddies. A butter is when you press on the nose or tail of your board to spin on flatland or while riding down the hill. Once you learn the basic butter, you can use it to spin on rails and jumps. If you want to do a lot of park tricks involving butters, you'll want the right board with the right setup. The best boards for buttering are freestyle boards. A freestyle board is shorter than all-mountain and freeriding boards, making it easier to spin and maneuver on rails and jumps. The freestyle board is flexible, but it's also responsive on turns and can be used for freeriding when desired. Don't be worried if you bought an all-mountain board. These boards are more directional in shape, but they still have enough flex to butter. The most important part of being able to butter on your board is how you have your board set up. You want your stance slightly wider than shoulder-width apart. Your knees should naturally bend when you're strapped into your board, keeping your center of gravity low. This wide stance will give you better balance and will force you to start turns or rotations with your hips instead of your legs. Widening your stance will help you keep your balance when buttering and will make the maneuver look more natural. Stance setback is how far your bindings are toward the tail of your board. Make sure your board is set up with zero setback for buttering. Your bindings should be centered on your board. Freestyle boards come with the inserts centered, but all-mountain boards may come with the inserts installed slightly toward the tail of the board. If you have an all-mountain board, mount the bindings as close to centered on the board as possible. The equal amount of nose and tail on your board will help you land and spin your butters in either direction. If you're going to be performing a lot of tricks and butters, especially on rails, jumps and other park elements, you'll want to mount your bindings in a duck stance. Set your front binding at a positive angle and your rear binding at a negative angle. Start by setting your front binding at 18 degrees and your rear binding at -6 degrees, then adjust the angles in either direction for comfort. A duck stance, similar to centering your stance, will help you spin and land butters in either direction. What Is the Exercise When You Lift a Dumbbell Behind You?